As sensors continue to get smaller, more powerful and cheaper, smartphones and other mobile devices incorporate over ten sensors to create self-aware devices. For instance, most recent models of Apple and Samsung handheld devices use several sensors to perform some of their coolest interface tricks: proximity sensor, accelerometer (motion sensor), ambient light sensor, moisture sensor, gyroscope, thermometer and magnetometer (compass). These sensors enable key capabilities for users including location services, health apps, fingerprint scanning and sophisticated gaming while optimizing power usage and WiFi access. The proliferation of sensors has created significant design and verification challenges as mobile devices often require as many as 10 sensors and more than 20 signals. As these requirements continue to grow, designers and verification engineers face mounting challenges to deliver the design, cost and performance efficiencies manufacturers need to expand product capabilities with more sensors. MIPI I3C, being developed by the Sensor MIPI Working Group, incorporates and unifies key attributes of currently existing interfaces, I2C and SPI, while improving the capabilities and performance of each approach with a comprehensive, scalable interface and architecture. This will reduce interface fragmentation thus reducing development and integration costs and fostering innovation opportunities. 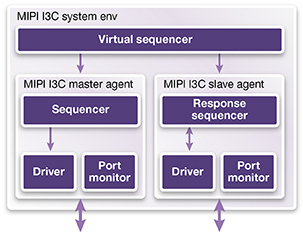 Synopsys VC Verification IP for MIPI I3C provides a comprehensive set of protocol, methodology, verification and ease-of-use features. Our current users indicate to us that they are able to achieve accelerated verification closure: native SystemVerilog and built-support for UVM enables ease-of-use, ease-of integration and high performance for them. You can learn more about Synopsys VC Verification IP for MIPI I3C and download the datasheet here. This post is filed under Debug, I3C, Mobile SoC, SystemVerilog, UVM.